Lindsay’s genetic make up has 2 time proven older Fleckvieh sires on her top side, Well House Kestrel and LJB Jade. On her bottom side is a cow we imported from the US back in 1999 with some out cross genetics we have tapped into on several occasions with much success. As the saying goes “the cows you don’t know are your best cows”. Well our Lindsay cow fits that description to a T. She consistently breeds AI and settles on first service, calves unassisted every year, following it up by bringing home a quality calf come fall year after year. 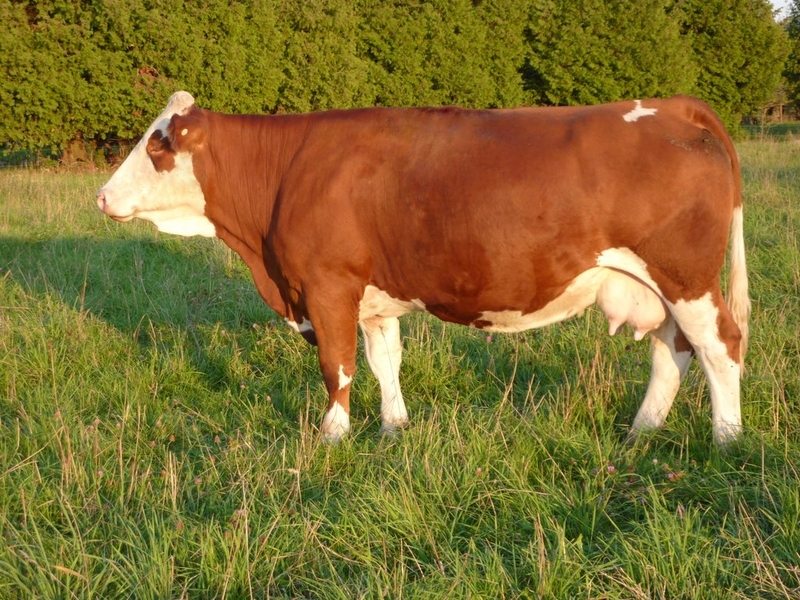 Her first born son, Dora Lee Lucas, is a herd sire for Rolf Huber. Her Eclipse daughter, Lorena, who is working here at Dora Lee just gave us twin heifers by the legendary Arnie 8 M. Lauren is working for the Kuluk’s at North Battleford, Sask. And Lindsay’s 2012 model, Lydia, was purchased by Norwood Family Farm. Lindsay’s genomic profile has her ranked in the top 25% for several traits including feed efficiency.